Toyohara Kunichika (1835-1900) Okubi-e of Bando Hikosaburo as Yosaburo, 1869. Oban. Perhaps the high point of ukiyo-e design of the nineteenth century are the very few and unique series of okubi-e produced by Kunisada in 1863, Yoshitora in 1862 and Kunichika, in this series from 1869 and another from 1873. It is customary to compare these prints to those of Utamaro and Sharuku who worked in a similar format, which was banned for fifty years for being too adulatory. I think in fact that these outstanding designs owe considerably more to the actor portraits of Hirosada and other Osaka artists from the 1840’s. There was a great deal of collaboration between the Utagawa artists and their Osaka colleagues in the 1830’s and even though Kunisada affected to despise the rival style, it was clearly a massive influence on these overbearing bust portraits. It is a vital and outrageous style of portraiture. The heads burst from the confines of the frame. Lines and expressions are hugely exaggerated, the colours are bold and defiant of conventional taste and the drawing is sparse and economical as in the smaller format masterpieces of Hirosada. 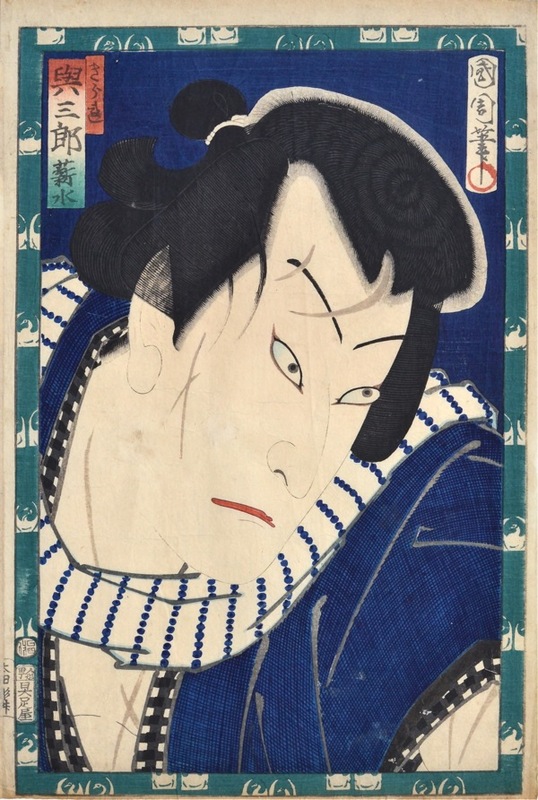 This portrait of the kabuki actor Bando Hikosaburo is derived from a classic play, Kirare Yosa (Scarface Yosa) in which Yosaburo falls in love with Otomi, the mistress of the gangster Akama Genzaemon (see also Otomi in the Yoshiwara). When Akama learns of the affair he has Yosaburo slashed all over his body and thrown into the sea. Otomi is rescued by a clerk and sets up in her own house in the town. Yosaburo, now known as Kirare Yosa, survives and becomes a petty criminal, breaking into the house of Otomi in error. She doesn’t recognise him because of his scars, but he proceeds to persuade her in one of the finest speeches of kabuki theatre. The lovers are eventually reunited and Yosa’s scars are healed by magic. Kunichika uses a print by Kunisada from 1858 as the model for his portrait of Hikosaburo. In this bolder treatment, Hikosaburo is shown in exaggerated close-up against a background of midnight blue. The famous scars of Yosaburo are drawn here as abstract crescents. The decorative border of twin cranes in a circle is derived from the mon, or crest of the actor’s clan or family. A very nice print from one of Kunichika’s most collectible series. Colour and impression are very good and condition is good, with some surface marks. Full size with margins, unbacked.